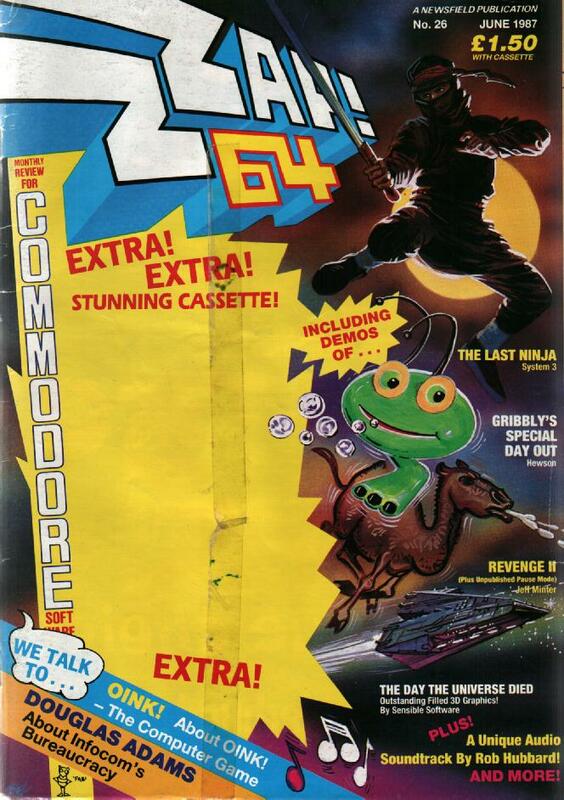 The first ever Zzap Megatape was born with this issue! It was full of game demos and had an audio track on the B side by Mr. Rob Hubbard. The Terminal Man also returned in a new series. Rob Hubbard's Aural Delights. "To all my fans, love Rob". Thalamusic - an audio remix of the Sanxion loading tune. Approximately five minutes and fourty-two seconds in length. Rob used authenic Fairlight samples, as heard on Jean Michel Jarre's Zoolock. The piece was perfoprmed on a Yamaha CX5M, linked up to an Akai S900 Sampler with a Digital Reverb and a Yamaha RX15 Drum Machine, and recorded on a four-track. Rob recently finished writing the music for Martech's Nemesis The Warlock, and is currently composing for Melbourne House's Wiz - a piece which will push the SID chip to previously unheard of limits (again). He wants to travel the world, help the sick and elderly ("we owe them a lot"), and write for the ST ("I've always been a great fan"). . .